Do you consider the Paternity image canonical? Because the painting of the holy women is its counterpart. The mere fact of the image being a gift from the wife of a priest does not confer canonicity upon it. Canonicity comes from an icon's ability to properly and faithfully proclaim theology and teachings. I made no false claim, so stop putting words in my mouth. It makes all your pleas for Christian charity and love ring hollow. There is division regarding the Paternity image just like there is no unanimous ruling on Toll Houses. Apparently some iconographers consider it canonical while others yell "heresy." Christ has no human father, yet interestingly his genealogy mentiones the line of David. The matter of God the Father as an old man has been denounced time and time again across the centuries by the Church, yet people still persist in painting it. End of story. Toll-houses have nothing to do with the matter at hand, neither does Christ's earthly genealogy. You're trying to muddy the waters, but it's not working. Not end of story. It apparently remains a theologumenon. That is why it keeps on being painted. I would not buy one or commission one, but have you seen any canons condemning it? Apparently HOCNA condemns this paternity icon, but they left ROCOR and have endorsed several heresies after their departure from Orthodoxy, so I cannot trust what they teach. My favorite icon is Christ Tempted in the Desert. Have any of you ever been able to come across one that's for sale? The iconographer at my parish offered to paint me one but I can't afford the $240 he charges. St John of Damascus, in his Exact Exposition of the Orthodox Faith, and in his In Defense of the Holy Images, and St Theodore of the Studion in his treatise on icons also condemn such imagery. They are by no means the only saints or Fathers who do the same. If we made an image of the invisible God, we should in truth do wrong. For it is impossible to make a statue of one who is without body, invisible, boundless, and formless. Again, if we made statues of men, and held them to be gods, worshipping them as such, we should be most impious. But we do neither. For in making the image of God, who became incarnate and visible on earth, a man amongst men through His unspeakable goodness, taking upon Him shape and form and flesh, we are not misled. Images are of various kinds. First there is the natural image. In everything the natural conception must be the first, then we come to institution according to imitation. The Son is the first natural and unchangeable image of the invisible God, the Father, showing the Father in Himself. "For no man has seen God." (Jn. 1.18) Again, "Not that any one has seen the Father." (Jn. 6.46) The apostle says that the Son is the image of the Father: "Who is the image of the invisible God," (Col. 1.15) and to the Hebrews, "Who being the brightness of His glory, and the figure of His substance." (Heb. 1.3) In the Gospel of St John we find that He does show the Father in Himself. When Philip said to Him, "Show us the Father and it is enough for us,"  our Lord replied, "Have I been so long with you and have you not known Me, Philip? He who sees Me, sees the Father." (Jn. 14.8-9) For the Son is the natural image of the Father, unchangeable, in everything like to the Father, except that He is begotten, and that He is not the Father. The Father begets, being unbegotten. The Son is begotten, and is not the Father, and the Holy Spirit is the image of the Son. For no one can say the Lord Jesus, except in the Holy Spirit. (I Cor. 12.3) Through the Holy Spirit we know Christ, the Son of God and God, and in the Son we look upon the Father. For in things that are conceived by nature, language is the interpreter, and spirit is the interpreter of language. The Holy Spirit is the perfect and unchangeable image of the Son, differing only in His procession. The Son is begotten, but does not proceed. And the son of any father is his natural image. Thus, the natural is the first kind of image. It is worth noting that, in this treatise, St John refers constantly to his forebears among the saints and fathers to give authority to what he says. 1. Did God the Father become incarnate? 2. Does the Church celebrate any feasts dedicated to the Father alone? Then what about the Rublev icon depicting the Trinity, in which 1 of the men represents the Father? The Rublyev Trinity, like the icon of the Hospitality of Abraham, show all three angels as equal. None of the angels are identified by name on either icon, and none bear the distinctive halo which we see in icons of Christ. The three mysterious men at the Oak of Mamre are a manifestation, not an incarnation. This distinction is extremely important. Wow, what happened to this thread while I was sleeping? 1. We have gone way off track. 2. This seemingly obvious condemnation of depicting the Father in the Damascene's writings is not apparent to me. 3. I was always taught that the Trinity is very obviously distinguished in Rublev's depiction, despite their not literally being the Trinity. The Father wears orange, the Son wears blue and red (just like in icons of him, a very distinct color scheme), and the Spirit wears green (the color of the Holy Spirit). Further, while being seated equally at the table, both the Son and Holy Spirit are shown bending their heads to the Father. The apostles should be holding a model of a church, symbolic of them being the pillars and founders of the Church, as many a hymn to them proclaims. The church is there, but obscured behind the totally misplaced motif of a Eucharistic symbol. I heard you like symbolism, so I put the Body of Christ in the Body of Christ so you can contemplate while you contemplate. Someone has seriously over-egged the custard. Far too much frou-frou. And the Child looks like he's about to burst into tears: Mama! Please don't jab me! And the Child looks like he's about to burst into tears: Mama! Please don't jab me! FWIW, I thought it kind of looked like he's about to sneeze. Yes, I agree as his eyes are partly closed and his mouth is slightly opened. Hardly a pose seen in Orthodox Christian icons. I get the same expression as Jesus right before I sneeze. edit - I was beaten to this observation. If you have higher resolution pic, I would be able to read Church Slavonic text, so far, I can only read few words. "Purity of soul... .... of Our Lord Jesus Christ... Guardian angel... .... .... by the grace "
What about the "ancient of days" icon? I'm pretty sure it's canonical but due to the aged appearance and the fact that such an icon does not appear in coptic iconography I'm not sure. "Icons" of God the Father as a bearded old man are uncanonical and unsuitable for veneration. In the icon of Moses receiving the Tablets, is it portraying Christ as the Ancient of Days or is the Father? I believe it is Christ. This reminds me of a ceramic Nativity set I painted some years ago, featuring a tepee and Native American children, a buffalo and wolf, etc. I always had very mixed feelings about it. I think something that really bothers me is exchanging the dove as a representation of the Holy Spirit for a hawk/eagle. Kind of reverses the entire symbolism. I do like the almost linking/intertwining of the hands of both of the human portrayals and the wings of the bird. Ah, and in typing that last sentence it hit me. I did not want to call them "the Father and Christ" so I was seeking a term to use. I settled on calling them both "humans". But while Christ became man, the Father did not. 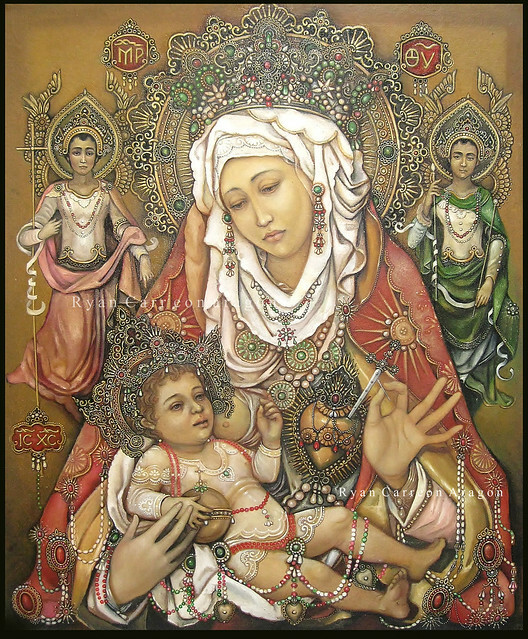 Can it be Christ, if He is also being held by the Theotokos in the same icon? And he does look old. Is Christ ever painted that way? If the bearded old man is Christ as the Ancient of Days, there should be an inscription of IC-XC around him. Given that the iconographer who produced this is Michael Damaskinos, it is almost certain that the old man is God the Father. Damaskinos was a 16th century iconographer of the Cretan School, who traveled extensively through Italy, and lived in Venice for some years. His work borrows heavily from religious painting of the Renaissance, both in composition and painterly style. He may not have the IC-XC inscription around him but he likewise lacks anything labeling him as God the Father (such as "Lord Sabaoth" as used at my local Old Rite parish). Indeed, with closer inspection, you can make out the cruciform halo unique to Christ rather than the eight-point or triangle halos that images of God the Father as the Ancient of Days often sport. The point is that the only proper iconographic portrayal of the Ancient of Days is one which clearly marks the old man as Christ. All three Persons of the Holy Trinity are eternal and timeless (which is what the idea of Ancient of Days expresses), but only one of the Persons became incarnate as Man, while remaining God. Lord Sabaoth simply means Lord of (heavenly) Hosts. The Lord in question is the Holy Trinity. The shape of the halo in Damaskinos' work is irrelevant in this case. Is this the "Ancient of Days" or God the Father? True, but every figure I've seen marked as such on icons (including on several I own) was clearly intended to be God the Father. If the cruciform halo is unique to Christ, wouldn't it then mark the figure bearing it as none other? I'm just not convinced the old man up top is meant to be God the Father and not God the Son, whatever Damaskinos may have done elsewhere. Funny thing about that IC-XC inscription, the Christ in the Theotokos' lap seems to lack it too. Is it the shape of the halo that gives it away? No cross or XC IC? (such as "Lord Sabaoth" as used at my local Old Rite parish). Interesting. Is God the Father a standard part of Old Rite iconographic tradition? Are there any other particulars/standards when he's depicted in icons? The Old Rite Church in Erie PA features no icons of God the Father to my knowledge. And this is precisely the problem with such portrayals. The cruciform halo expresses what and who God is. Yet it is only the Son and Word who became incarnate. Damaskinos' works, and that of his contemporary, Emmanuel Tzannes, are replete with imagery straight out of Renaissance art, which had long broken any connection with the forms and traditions of iconography. The works of these two men are interesting and skilfully-painted, but fall quite short of what iconography is and stands for. ... and the standard inscription for the Mother of God is also absent. She is bearing only one star of ever-virginity, which is also a common feature of Roman Catholic art. It may have at some point, or possibly not - many parishes don't come close to having every "standard" icon. Interesting. Is God the Father a standard part of Old Rite iconographic tradition? Among certain groups it seems. The priestless Chasovennye tradition ("Chapelist") to which I belong seems to accept it wholeheartedly. Nowhere is this more obvious than in the central icon of my parish's iconostasis, a large painting of the "New Testament Trinity" with Christ and God the Father seated and the Holy Spirit as a dove between them. Other groups, such as the Pomortsy, are better about that sort of thing and eschew depicting either God the Father or the Holy Spirit, except perhaps in those icons where it is canonical. As Sam G noted, the Church of the Nativity in Erie, which came from the Pomortsy tradition, likewise seems to lack those elements. Are there any other particulars/standards when he's depicted in icons? That last image of the Ancient of Days given by Sam G seems pretty representative. He is often depicted as the Ancient of Days with a halo consisting of two overlapping diamonds (often with one red and the other blue) and bearing the "Lord Sabaoth" inscription. It's sort of a moot distinction if only Christ is ever depicted with it. Among certain groups it seems. The priestless Chasovennye tradition ("Chapelist) to which I belong seems to accept it wholeheartedly. No where is this more obvious that in the central icon of my parish's iconostasis, a large painting of the "New Testament Trinity" with Christ and God the Father seated and the Holy Spirit as a dove between them. Other groups, such as the Pomortsy, are better about that sort of thing and seem to eschew depicting either God the Father or the Holy Spirit, except perhaps in those icons where it is canonical. As Sam G noted, the Church of the Nativity in Erie, which came from the Pomortsy tradition, likewise lacks that sort of thing. But aren't red and blue the colors of the Christ? Pretty neat, thanks. The Chapelists just got a +1 in my book (God the Father/NT Trinity icons have long been a guilty pleasure of mine). Not moot at all. Icons must be faithful to what the Church teaches, and the fact remains that the Father never became incarnate. Exactly, which is why depictions of the Ancient of Days with the cruciform halo, yet without the explicit IC-XC inscription, must be of the Son.